Pia was the guardian that evening. She sent me the following chat log with her comments. The first few lines are from my log, after which Pia arrived. The photograps are provided by Sylectra. stevenaia Michinaga: how was your weekend? Pema Pera: I guess yours is still ongoing? Pema Pera: “the city” = ? Steve and Pema were already chatting in the Pavilion when winged Syl and I walked in. Then Fred arrived. Pema Pera: nice colors, Syl! Sylectra Darwin: i love that this pavilion has a hole in the top. Friedrich Ochsenhorn: hey everyone! what’s shakin? Sylectra Darwin: A “hole” lotta shakin goin on. Pema Pera: or blown out? Sylectra Darwin: It was useful to fly through on the way in. Naturally our tech team started talking about new wiki. Sylectra Darwin: I did the best I could. Sylectra Darwin: It really seems a great fit for us. Sylectra Darwin: And now my little postcard system is going to run like a champ. Sylectra Darwin: …well, once my friends the techies figure out how to configure that part. Friedrich Ochsenhorn: yeah - that’s something that flickr makes possible. Sylectra Darwin: Where is that info, because I have spent HOURS looking for useful cross posting info. Sylectra Darwin: I know that Snapzilla works with SL to do something similar. Sylectra Darwin: I love Internet toys. Pema has a really long-term concern! Pema Pera: One question that I occasionally wonder about is how much of current information will be available, say, 25 years from now . . . . . . unlike printed paper. Will flickr be there? Will our blogs be there? Will our wiki be there? stevenaia Michinaga: how can you answer such a question Pema? Sylectra Darwin: Pema, I think the info will be there if we are careful to take care of it as it evolves from platform to platform. Sylectra Darwin: It might be argued that this group grows every day and today’s info is not relevant to tomorrow. We must live in the moment, so to speak. Sylectra Darwin: I still have Word docs that I created in 1991. Sylectra Darwin: I just converted them as the platforms and formats changed. Sylectra Darwin: how about I write a book? Friedrich Ochsenhorn: so does a sand mandala…. Pema Pera: If I would have come across a blog like ours a few decades ago, it would have saved me a lot of time and exploring . . . .
Sylectra Darwin: As long as we make it a priority to preserve that info, we will do it. Sylectra Darwin: Exactly. Just need to add it to the critical path. Pema Pera: including the indirectly linked photos like in flickr? Friedrich Ochsenhorn: of the current state of the wiki, or its full history? Pema Pera: who are these people? Pema Pera: do you know their background? Sylectra Darwin: I think it would be a good idea to have a blend of Flickr linked images and archived photos, don’t you think? Pema Pera: how hard would it be to make a code/script to construct a full stand-alone reproduction of “everything” say once a month? — Question is what “everything” is ; obviously not every outside site we link to . . . .
Pema Pera: off of in what way? Cale came in and he was born today! Pia Iger: Hi, Cale, born today? Cale Andel: so you talk about politics and stuff? Cale Andel: mentality and state of being? Pema Pera: Hi there Nash! Nash Fraenkel: well, not so ironic perhaps. Nash Fraenkel: I was curious to see what would attract the attention of a newbie. Sylectra Darwin: Do any of you mind if I take a few photos and name you in captions? Nash Fraenkel: and it seems that my instinct was right in that you found something very interesting indeed. Pema Pera: And talking about permissions, Cale and Nash, I like to add some parts of our conversations to our blog, is that okay with yourboth? Nash Fraenkel: I’d be honored. Nash Fraenkel: i believe it is also a TOS violation to quote someone without permission in many instances. Pema Pera: that would make sense! Pema Pera: Nash, you’ve been in SL a long time! Nash Fraenkel: so then you view ideas as a proprietary thing, Cale? Pema Pera: what have been your main interests and activities, if I may ask? Nash Fraenkel: not so very long, but an eternity in SL time. Nash Fraenkel: i’m sorry, i assumed a type. Nash Fraenkel: so ideals, ideas, the question applies equally well. We learned more meanings of “sim”. Terri Holrych: u mean ur avatar? 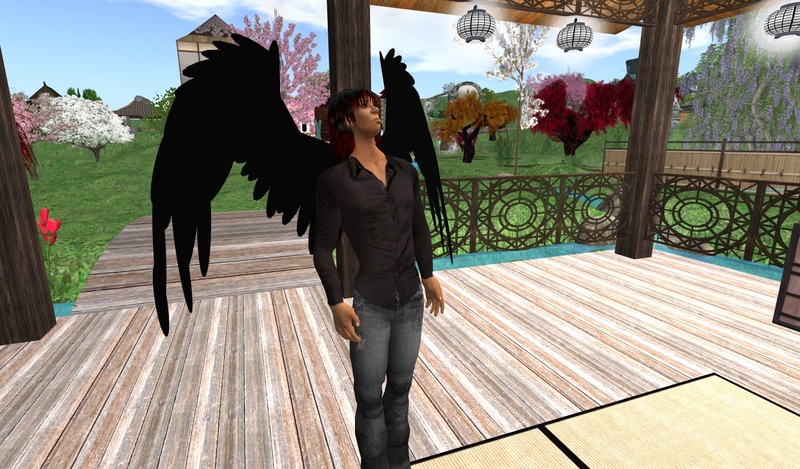 Nash Fraenkel: sim is SL jargon, short for simulator, which is a server running a region of the grid. Cale Andel: so who is the loner out there? Sylectra Darwin: I remember sim being used in the Tad Williams Otherland series meaning avatar. Nash Fraenkel: we are near to a welcome area, Cale, so there will be much traffic at times, I imagine. Pema explained more of PaB to Cale and Nash. Fred had an interesting thinking. Nash Fraenkel: i don’t often pay attention to the passage of time. Pema Pera: buy Cale, thanks for stopping by! Nash Fraenkel: nice to meet you, cale. Pema Pera: interestingly, reality is a lot more powerful than civilization it seems — 1% time for reality is able to undermine the 99% for civilization, as far as we are experiencing here . . . .
Nash Fraenkel: i suppose it doesn’t take much to remind oneself that we view the world through a prism of rules called civilization that has little to do with reality. Sylectra Darwin: Good point, Nash. Friedrich Ochsenhorn: hmm… I would be cautious about venerating reality, at least if its construed as external to us. If we our included in the equation, I suppose that’s slightly different. Nash Fraenkel: well, can there be reality without ourselves? Sylectra Darwin: I love it when you guys start defining terms. Pema Pera: I guess Fred was refering to a so-called objective view?? Fred then brought up an essay while Jay came in. Sylectra Darwin: Oh cool, would love to read that. Sylectra Darwin: Jay, do you mind if I take your pic? Sweet Terri gave each of us a gift, while Pema took his leave. In between, Fred and Syl continued their talk about the essay. http://playasbeing.wordpress.com/ is our blog — okay to include our conversations in there? 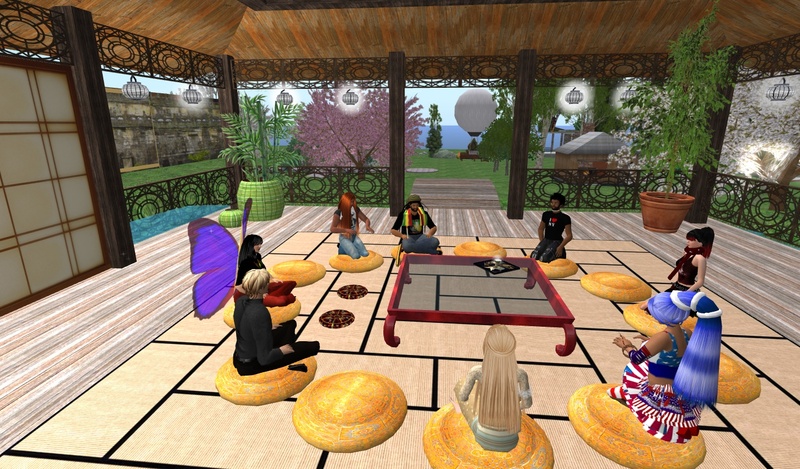 Terri Holrych gave you Free Buddhist Resources for SL noobz. Friedrich Ochsenhorn: heh. pass the peace pipe. Nash Fraenkel: Hello, Jay, I didn’t notice you arrive. I was distracted for a moment. Pema Pera: nice talking with you all! Sylectra Darwin: Nite, Pema, always a pleasure. Pema Pera: but normally she runs a very tight ship! Pia Iger: where will you post your response,Fred? Pia Iger: ok. Will check it out. It’s the second time I met Caspian today. He hit off with Jay. Nash Fraenkel: i imagine his thesis along the lines that there is too much information for a human being to truly be able to from a thought-model that adequately captures it? Sylectra Darwin: I’ve been hanging with these lovely people for a few weeks and they are golden. Nash Fraenkel: i’m curious myself to hear what I get from it. Friedrich Ochsenhorn: CRASH! sorry about that. Caspian Inglewood: you are long way from New York here! Sylectra Darwin: That’s always a good message. Friedrich Ochsenhorn: anyways, its actually getting a bit late. i just came back to make sure you knew i hadn’t disappeared. Sylectra Darwin: Me too. Thank you all for the lively discussion! Fred, Syl and Steve left. I wanted to go too, but was quite intrigued by Nash’s unusual way of finding us. Nash Fraenkel: so, you meet here 4 times a day? Caspian Inglewood: so, for what reason has everyone come? Pia Iger: welcome back some time. Pia Iger: It always great to discover something by accident. Nash Fraenkel: and when he stopped here, I came to see. Pia Iger: help you to find places? Nash Fraenkel: i find that children like me because I am open to the wonder of things as they are and yet have understanding of things that they seek. Pia Iger: children can be inspiring. Nash Fraenkel: and yet, here I am now. Pia Iger: I’d like to hear more of your exploration next time. Nash Fraenkel: i’ll come again as I am able. Caspian Inglewood: how was your sake Baxton-san? Nash Fraenkel: i seldom drink myself. Caspian Inglewood: what was famous King name? Pia Iger: ok, I have to go. You guys keep chatting. I left Jay and Caspian at the Pavilion to keep chatting. My mind was still delighted by Nash’s story.